﻿ Speed Test, Traceroute, Ping Test, Internet Hops - What is it? At its most basic, a network speed test is a tool used to see how fast your internet connection speed is. Many times these services are used to determine what is making one’s internet problematic, or out of the norm, when the user is experiencing internet connection difficulties. The user would then run a connection speed test to obtain data about their internet connection. The Download Test Files are used to test the speed of downloading from our Data Center. The Speed Test Applet is used to test the speed of your internet connection to your internet service provider. The Traceroute function is used to test the route your internet connection takes to get to our servers. So what causes the internet to become slow in the first place? What’s the need to test connection speeds when your Internet Service Provider (ISP) offered you a certain speed? What Causes the Internet to Slow Down? The internet is much like the crowded freeways of Los Angeles during rush hour. Traffic, traffic, and more traffic. And the traffic is trying to merge and exit much in the same manner as a freeway system as well. It’s understandable then, that whenever there’s a large amount of people trying to use the internet at a particular time (say, Saturday Night movie time) the internet-freeways get congested and slow down. What used to take less than a second to load, could take several seconds or longer now. It sounds like a first-world problem, and maybe it is, but we’ve all been there. And Internet speed is generally determined by your ISPs point-of-presence (POP). A point-of-presence, or POP, is just an access point provided by your ISP that connects to the rest of the internet. So, when you type in where you’d like to go on the internet (say, colocationamerica.com) your router sends out a signal (part of the traffic we talked about above) to the POP which then routes it to where it needs to go. The larger your ISP, the more POPs they’ll have, and typically the more reliable your internet connection will be. Typically a POP is located within a data center where all the routers, switches, servers, etc. are hosted—the gateway of the internet! But it’s not just a straight path from your the POP to the destination. Your router’s signal is going to bounce around to other routers (one highway to the next) until it finally reaches its destination. Then the destination router sends it back through to your router where the web page is loaded onto your screen. These routers that your signal bounce around on are some of the most crucial aspects of your Internet speed and they are called hops. Each time your packet of information is sent to another source, or router, and pushed forward to the next it’s referred to as a hop. To test the amount of hops it takes for your packet of data to reach its destination you can run a command line IP traceroute (Windows: start menu → run → cmd). This will send a packet of data to the destination, but also request that the hops it reaches send back some information. Each hop is placed on a different line. Notice that my request went through 13 separate hops to reach its destination. Notice also that each router sent back its IP address so we have a better understanding of where our data went. As touched upon above, a traceroute is simply a utility that takes note of the route (or router-to-router-to-router highway transportation, following our analogy) between your computer and the destination on the Internet you’re trying to reach. Thusly, performing a traceroute will give you a detailed look of the route a packet will take as it travel from one network system to another. Notice that while to connect to Google it took 13 hops with no longer than 23ms of latency. Connecting overseas, however, took 17 hops and upwards of 150ms of latency. Notice also, hop #13 sent back no information. That could be a result of many things, but the most common being that that particular hop has a large amount of traffic and simply can’t respond to the tracert command. That’s mostly likely what happened in the above scenario as we were still able to reach our destination. Had the tracert continued to get those errors, then we would know that hop #14 is where our connection issue lies. Tracerouting is a great way to determine the strength of, say, a colocation or dedicated server provider much like us! In fact…. Seeing how Colocation America’s servers connect to other websites will give you a good idea of the connectivity we have to offer. Hosting with a dedicated server from Colocation America lets you take full advantage of our vast ISP networks, peering contracts with other ISPs, and our MMR which connects our data center clients with each other. We provide a way for your server to get a better connection by limiting the “hops” it takes to connect to another network. With such network redundancies, we offer superior connectivity with direct connections to top networks that can limit the latency and potential connection problems. If you’re having trouble with connecting to a website, running a ping test can let you know quickly is the host is online or not. As expected, Google is online and running. 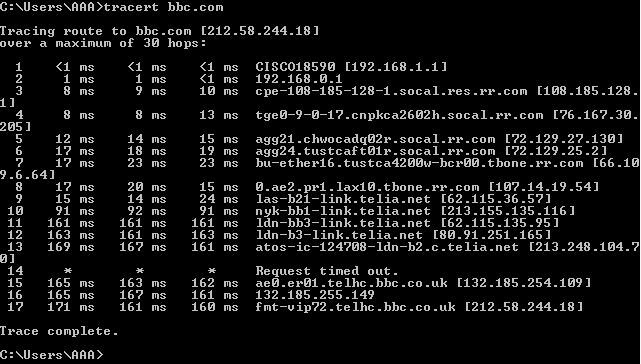 If you’re having problems it could be on a hop, which is when you’d use the traceroute utility.